Brain Edge, the ultimate brain supplement, has over 23 vitamins and nutrients that not only support overall health but are proven to help increase energy, give you a more restful sleep, relieve stress, and improve your mood. 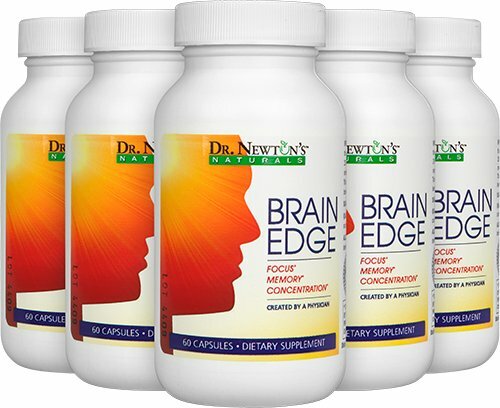 Brain Edge promotes memory recall to help improve concentration, and combines 23 powerful clinically proven neuro-protectants designed to help mental sharpness. A safe and natural vitamin that helps add back essential brain nutrients that diminish with age to maintain memory, clarity, and mental edge. Seeking a healthier lifestyle? See how Brain Edge can improve your focus and concentration! If you have any questions about this product by Dr. Newton's Naturals, contact us by completing and submitting the form below. If you are looking for a specif part number, please include it with your message.